Greetings and salutations casino-fans! 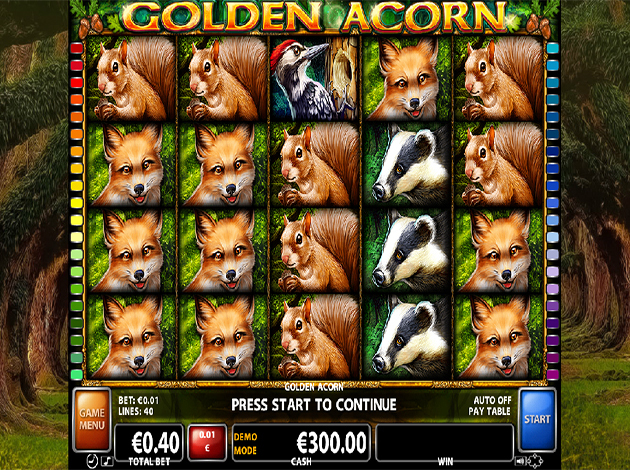 Videoslots.com are proud to present yet another one of our new casino games from Casino Technology called Golden Acorn. It’s a 5 reel video slot with 40 pay lines with Wild- and Scatter-symbols. There are no bonus rounds, but every time you win there’s a possibility to gamble and multiply your win either 2x or 4x. If you’re familiar with Casino Technology’s Game Style meter, this one has been labelled as “Smooth”. The normal symbols in this video slots consists of various cute animals, there are: Foxes, lynxes, wolves, squirrels, bears, owls, badgers, and woodpeckers. The Wild-symbol can be found on reels 2, 3, and 4, and is depicted by a Golden Acorn. These Wild-symbols can turn into any other symbol if it makes for a winning combination. There are also Scatter-symbols in this game, they look like a golden flower and you win if 3 or more of them are found anywhere on the reels when they have stopped spinning. Speaking of wins, every time you get a big one coins fly through the air in a brief animated sequence to give that extra good feeling. Did you know that this slot has a backstory, a happening that it’s based on? We’ll try to shorten it a bit for the sake of keeping this relatively brief. Once upon a time there was an adolescent girl called Sahasrahla. The only thing on her mind was adventures, Sahasrahla’s biggest idol was a character played by Harrison Ford known for his hat and whip. Sahasrahla lived with her grandmother after her parents passed away in a tragic butter churning accident. One of Sahasrahla’s favourite bedtime stories was The Golden Acorn, legend said that there once was a golden tree with beautiful golden flowers high up in the Tibetan mountains. If you managed to find a Golden Acorn from this tree, it would bring a thousand years of happiness. Which is just too much for Sahasrahla who just had to go on an adventure in the Tibetan mountains, but her grandmother wouldn’t let her. “Adventuring isn’t for little girls, you should focus on finding a man”, grandma always said. But Sahasrahla wouldn’t listen and went anyway, the day after her 16th birthday to be exact. Arriving in Tibet after sneaking a ride with a cargo ship full of cattle was probably not the ideal way – but at least she made it there in one piece. Her friend Purrte Krutis tagged along, not exactly a rocking physical specimen but he was an incredibly smart lad. The two of them spent 12 years wandering the Tibetan mountains without even a birch with gold paint on it. Nothing. Squat. Nada. Tensions were high daily and Purrte almost gave up, until they suddenly arrived to a deep misty valley so humid that Sahasrahla thought there had to be a sauna down there. But it wasn’t. It was a small, ugly tree with a thin grey trunk and dried leaves lay on the ground. They climbed down to the valley and upon coming closer Sahasrahla noticed that under the dried leaves was ten golden flowers. This was it. The big Kahuna. The final boss. The reason for coming to Tibet. These 12 years wouldn’t have been for naught, grandma would surely congratulate her when she got back with the golden aco… Right. The Golden Acorn. That was the reason for coming to Tibet, not the golden tree! Purrte and Sahasrala decided to set up camp close to the almost dead tree, and before they went to bed Purrte made sure to give it some water. Because, you know, it being a supposedly magical tree and all. And what do you know? When Purrte and Sahasrahla woke up, they packed and gathered their belongings to leave the tree and go home in disappointment when Purrte noticed something gleaming in the periphery. The tree had come back to life thanks to the water it got the night before! In arms reach were hundreds of golden flowers and they could see rainbow coloured leaves everywhere, the tree was so much prettier this time. Especially since it now had a Golden Acorn resting on one of its branches. They snagged it and went home, married, got 9 children, and settled down with Sahasrahla’s grandmother in a little fishing village called Howth just outside Dublin. The Golden Acorn was kept on the mantelpiece and brought them good luck for the rest of their lives. Some say that the Golden Acorn is still in Howth, inherited down in their family for hundreds of years. So maybe it’s time to pay Howth a visit? Before you visit Howth though, how about you try playing this wonderful video slot first? Casino Technology sure outdid themselves with Golden Acorn. We at Videoslots.com hope to see some big wins from this casino game, good luck!